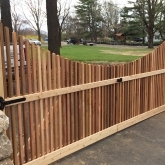 We are well-equipped to handle any Westport, CT fencing job, no matter how big or small. 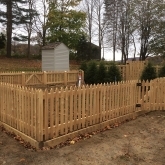 Our professional team at Roots Landscaping have completed many different fencing projects in Westport, CT and it continues to be one of our best markets year after year. You may have even seen Roots Landscaping work on one of these fencing projects in action if you regularly drive through the city. We are here for all your fencing needs. As members of the American Fence Association, Roots Landscaping is a team of dedicated professionals that strive to provide high quality, pristine work and is here to help you and your business choose the fence that is just right for you. There is an infinite selection of fence types to choose from for an area. Consider why it is that you want a fence. Do you want security, privacy, provide a safe environment for children and pets, or reduce the noise around your house or business? No matter why you need it, Westport businesses and residents should use Roots Landscaping to complete their fencing project. 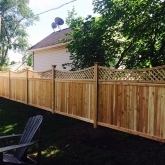 Our top fence partners provide exceptional, high-quality fences. 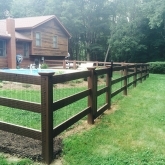 To learn more about our fencing products, visit here. It can be hard to maneuver around the unexpected elements that can impact the quality of your fence. Roots Landscaping provides a wide variety of different fences with expert installation. 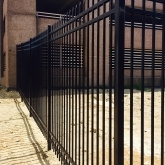 After analyzing the land that you want fenced up and consult you about what type of fence is best for you, we will measure around the area, carefully examine the terrain and install your fence properly. The cost will be different depending on its material, height and length. Roots Landscaping will make sure your fence repairs are done properly and carefully. The problem and type of repair you need will be determined by our knowledgeable and professional staff. When fungi eat wood, this results in rotting wood. This decomposes the fence that you have. You often need to chemically treat, patch and repaint or stain the fence in order to treat the wood. The board may need to be replaced if it is too rotten to be replaced. 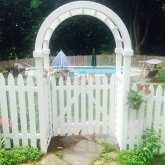 We are the best fencing contractor for replacing or repairing the rotting wood in Westport, CT. Greater portions of your fence can be damaged by falling or deteriorating if your poles are not replaced. They provide structural stability, but fence poles will often naturally shift over time. Replacing and repairing fence poles are easy ways to maintain the longevity of your fence. Patching holes and filling cracks will be different depending on the type of fence you have such as wood, vinyl, chain, etc. To prevent greater damage and keep your fence in the best shape, the best way to do it is to patch your holes and fill your cracks. Call Roots Landscaping today to learn more about how to repair your fence’s missing boards. 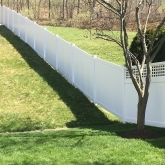 A common type of fence repair, the type of fence, length of board and height of the fence will make the repair process different. It’s important that you prevent fence collapses in a timely manner by fixing the missing boards because they are a much costlier expense. 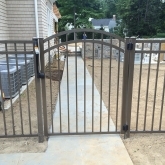 In addition to top-notch fencing installation and repairs, Roots Landscaping provides expert masonry and landscaping services in Westport, CT. If you are interested in any of these services or if you are unsure about the type of fence you need and want to learn more about our company, contact Roots Landscaping today. We are awaiting your call at 203-702-4408.